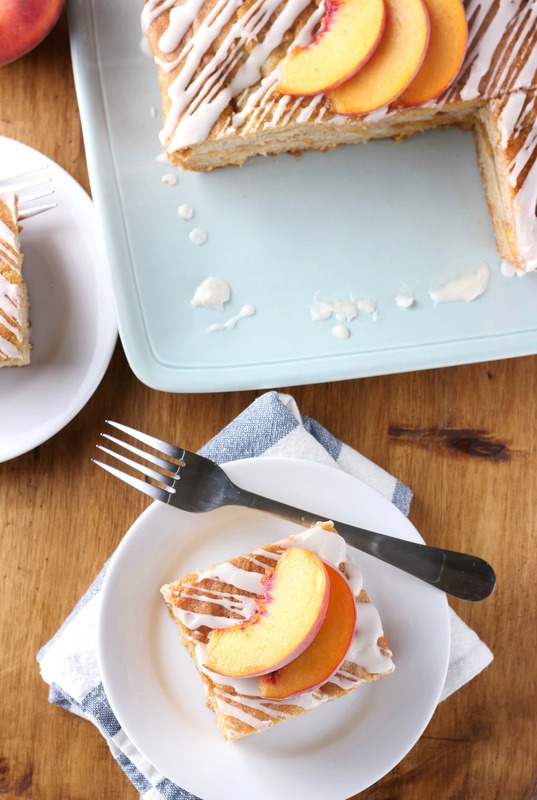 This Peaches and Cream cake is made up of fresh peaches that are sandwiched between layers of cake flavored with hints of cinnamon and ginger and topped with a creamy vanilla glaze! A perfect summery dessert or addition to brunch! *Recipe and text from 06/10/13. Images updated 07/18/17. Fresh peaches remind me of summer and our grocery stores have just started displaying all of the different varieties. Since the official start of summer is just days away, I figured it was about time that I started making good use of the abundance of peaches. Though I usually prefer eating peaches raw or grilled, this cake is one that even I had a hard time stopping at one piece! Fresh, juicy peaches are tossed with brown sugar and spices to bring out the peaches’ natural sweetness. The cake is more dense than your average cake and almost has the texture of a pastry bread. It has a hint of cinnamon, nutmeg, and ginger to heighten the flavors found in the filling. 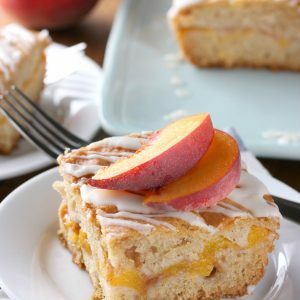 The cake is topped with a creamy vanilla glaze that brings the cream aspect of the favorite peaches and cream combination. Since it’s not overly sweet, this cake makes a great addition to brunch along with being a summery dessert. If you don’t want the sweet glaze for breakfast, feel free to leave it off. However, I strongly recommend that you don’t skip it! 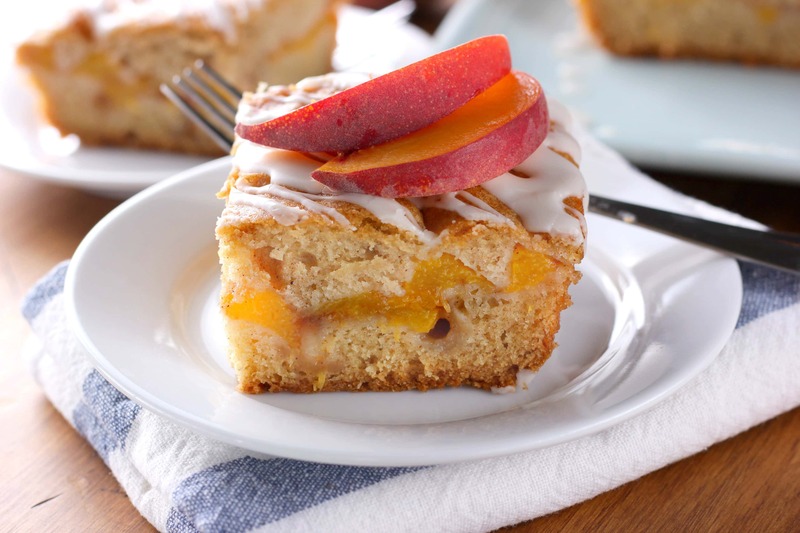 The creamy sweetness is a perfect topping to this fresh peach cake. Grab a slice for breakfast and sneak another slice for dessert! Preheat oven to 350. Line an 8x8 inch baking dish with aluminum foil and spray with non-stick cooking spray. In the bowl of a stand mixer, cream together butter and sugar. Add in eggs, one at a time and beat until creamy. Scrape down sides of bowl as needed. Beat in milk and vanilla. Add flour, baking soda, cinnamon, nutmeg, ginger, and salt. Beat until just combined. In a separate bowl, mix together all ingredients for filling. Spread half of batter into the bottom of prepared baking dish. Evenly distribute peach filling over the top. Drop remaining batter by tablespoonfuls over peaches. Gently spread batter over peaches. Bake for 30-35 minutes or until edges just start to turn golden brown and toothpick inserted into the center comes out clean. While cake is cooling, stir together ingredients for glaze. Drizzle glaze over the top of the cooled cake. Peaches are one of my favorite summer fruits! This look great! Oh, this is going on my “recipes to make” list. I admire and appreciate so many but there is no way I will be making them all. THIS one is diferenct. So pretty and I love the ingredients. 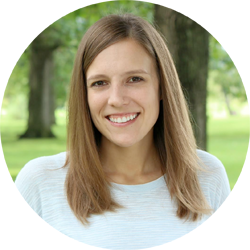 Would you please stop by my blog hop this week and add this post as a link? It is called Wonderful Wednesday on Ducks ‘n a Row. Goes live Tuesday evenings at 7pm EDT. This cake looks so fresh, easy, and delicious. It looks like a cobbler style cake, which is right up my alley! Ooo, this cake looks so scrumptious, Jessica! I can’t get enough of peaches in the summer! This looks absolutely delicious! Beautiful pics and it’s so perfect for a summertime treat! Love the fresh peach filling Jessica! We eat loads of peaches! Happy to have a new way to eat them! What a delicious cake! Perfect for summer! Oh boy, peaches and cream =one of my favorite flavor combinations of all time, I must try this!! What a beautiful summer dessert! It look so delicious – I’ve got to pick up more peaches now! I love a dense cake so this sounds perfect! I prefer to eat my peaches in baked goods as I don’t like the fuzziness on the outside! We have a farm that grows peaches right down the road. Unfortunately they won’t be ready till August. I will definitely be making this cake before then. Peaches just shout summer to me too – I can never get enough when they’re perfectly ripe. This is such a fun way to serve them – love that pretty glaze on the top! Oh my goodness!! This cake looks divine divine divine! I definitely want to make this. Yum! I love the fruit in this cake- so moist! And that glaze just tops it perfectly. 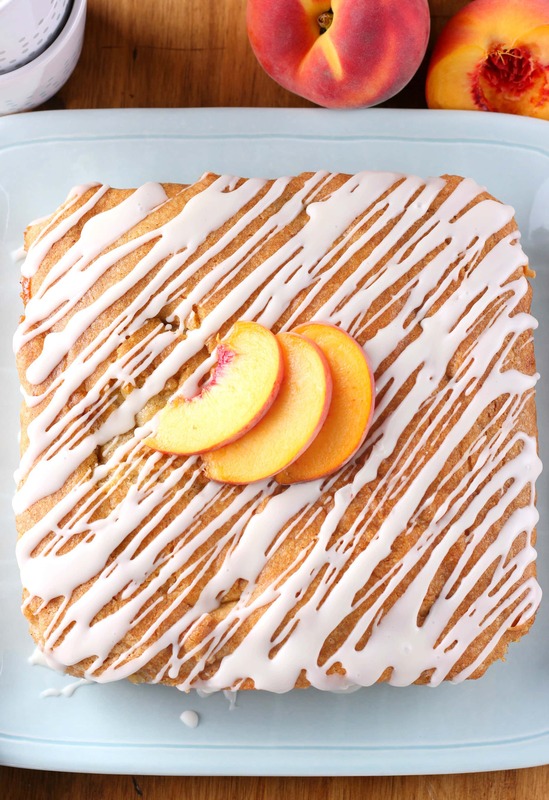 I really wish I was allergic to peaches, because this cake looks so amazing!! YUM! I mean, I wish I wasn’t allergic, DUH! this is so pretty! 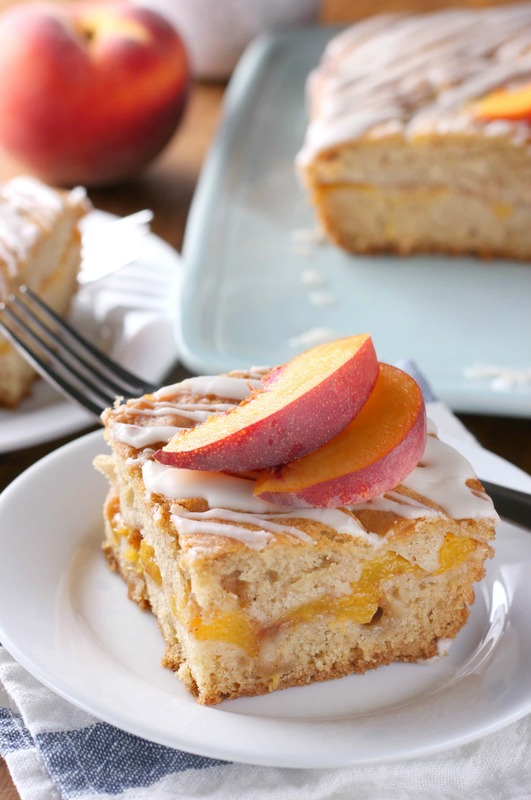 I love baking with peaches, I definitely need to try this! yum! I’m so happy that peach season is just around the corner here in the south! This cake looks fab! I love peaches but they seem so late in the season here. Grocery store ones just cannot compare to ones right off the tree. Love the recipe! My Dad would love this and Father’s Day is coming up! Perfect! Stunning, Jessica! My mom goes wild over peaches – pinned this to make for her (and um, ME) later. It’s as if you knew I just bought peaches yesterday and am dying to bake them today. This looks scrumdidilliumptious! I am giddy with excitement getting that first batch of peaches at the farmers market! When I do, I am gonna make this cake. Eek! Normally I’m not a huge peach girl, but this cake looks like an exception I’m willing to make 🙂 love that heavenly glaze! We had slices peaches for breakfast and now I wish I had seen this recipe sooner. But no worries, I still have peaches and the season has just begun. Yum!! This cake looks so good! I’m saving this recipe for the next time I have some peaches. I bet it would be good with apples in the Fall, too. This looks so lovely. There is something so girly about anything ‘peaches & cream’! This is a beautiful and simple way to use peaches. I’m so excited they are back in season! What a great way to use peaches! I ‘m looking forward to trying this cake! This looks incredibly good! I love you pictures and that glaze looks amazing! I think I ‘m going to have to stock up on some peaches so I can make this for July 4th! I could probably take down this entire cake. I lurve peaches! What a fabulous use of fresh summer peaches! This cake looks just divine. I’d love a slice right now! I can’t wait till our local peaches are ripe! These beautiful bars will be added to may baking list! I made this for my bookclub and it was a smash hit with everyone! Thank you so much for the recipe. I doubled the ingredients to make a 9×13 pan, and next time, I think I will make the glaze with peach schnapps rather than vanilla. But it’s a great recipe. This one is a definite! This is the first year that we have not had an abundance of peaches, but next year? Not-too-sweet? Right up my husband’s alley.Great job! I had some peaches I needed to use so I looked for a recipe and ran across this one. My family LOVED it!!!! I even screwed up the recipe and forgot the glaze and it was still amazing. I went and got more peaches and am making it again, and copied the recipe for my mother. Thanks for making this recipe available, a new family favorite! This cake is so fluffy and looks gorgeous with all those sunny peaches! I can’t wait to try it! I love peaches, but I’ve actually never baked with them before. This looks and sounds amazing…and it looks so fluffy. I’m not the greatest baker, but I will have to give this a try. I’m just having a dozen of juicy and fresh peaches from my garden. Great recipe, thank you.